Why choose Car loan Express - Credit Pre-Approval – state of Virginia. Auto loan financing for chapter 7 or 13 bankruptcy. We understand that the decision to file bankruptcy was not an easy one. We also understand that you are faced with a lot of uncertainty. You're probably wondering if anyone will give you a loan and what you are going to do for transportation. Our goal here is to not only help you get the car, truck,or SUV that you need at a loan payment you can afford,but also counsel you on how to re-establish good credit. We will take the time to go over your current credit situation and help you develop a plan to start your new credit life off on the right foot. The reason we do all of this is simple. We have found that if we invest in our clients during their deepest time of need, they will become lifelong customers. This is how we developed our slogan "WE BUILD CLIENTS FOR LIFE." If you plan on keeping a vehicle during bankruptcy, you must call now BEFORE it is discharged! You hired your bankruptcy attorney because you felt that he or she was the best choice to steer you through your bankruptcy filing. Undoubtedly, your bankruptcy attorney had the knowledge to file the proper paperwork with the courts which allow the discharge of your debts. The problem lies in the fact that most attorneys are unable to keep up with the ever changing automotive and finance market. It is simply not their area of expertise. For that reason, we see so many people maintain an upside down car loan simply because they feel there are no other options. 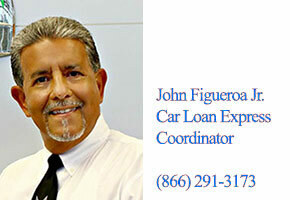 Call John Figueroa today and allow me to do a five minute evaluation of your situation before it is too late. Regardless of whether you finance a car from us or not, you will at least have the knowledge to make an informed decision before you no longer have a choice.